Stress is something we all face on a day-to-day basis. But stress isn’t what happens to us, it’s really how our minds and bodies respond to what happens to us. It’s healthy to be able to respond to stress. Imagine if you were out swimming and saw a shark. Your heart rate goes up, your body pulls the blood back to your core – so your hands and feet get colder, your pupils dilate to take in more visual information, your breathing & muscle tension increase. All preparing you to either fight or flee from this threat. Once you’re back on shore, all these responses should be turned off & your body returns to a normal calm state. All of this is regulated by your nervous system – specifically the autonomic part of the nervous system. Living in today’s modern society means far too many of us are turning on that stress response too often & for too long. Our non-stop lifestyles means this stress response is inappropriately kicked into high gear and for longer than necessary, making this situation chronic. This means that you could be in a “fight-or-flight” or constantly stimulated state too often to be healthy. At Back to Living Chiropractic, we’re here to increase your ability to respond to the demands upon you. Helping your body change in a stress-filled life. We’ve found that when the brain & nervous system are in balance and able to respond appropriately, you’ll thrive in your world. 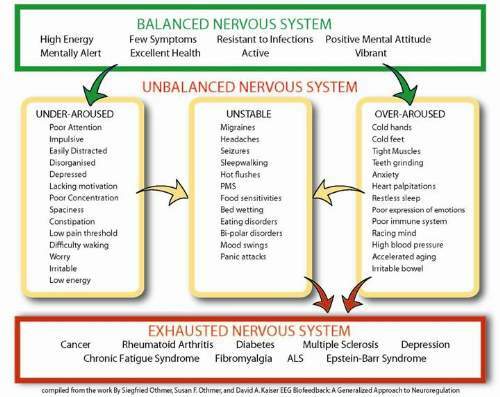 Have a look at the list below to see if your nervous system isn’t able to respond as well as it should to your daily loads. Our Stress Response Evaluation shows us where you’re not able to respond, and then with gentle, specific chiroprcatic adjustments, at home exercises and biofeedback training, you’ll see your nervous system come back into balance, your energy levels rise & your health return. If you have questions not answered here, give us a call or email us here.